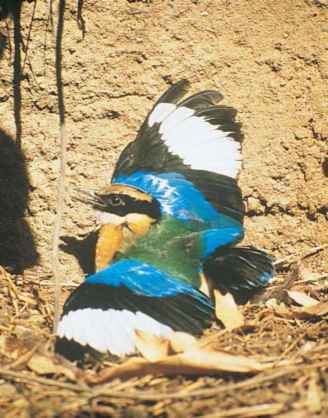 Members of this family are territorial when breeding, and males are often very aggressive, threatening and chasing intruding individuals of their own and other species. Commensal wagtails often show aggressive behavior to their reflection in car mirrors and hubcaps, threatening and attacking the image vigorously, often for prolonged periods. Many species form flocks when on migration and in the nonbreeding quarters. Wagtails often roost communally, sometimes with other species, usually in reedbeds but also in bushes or scrub and sometimes at sewage works, factories and greenhouses. 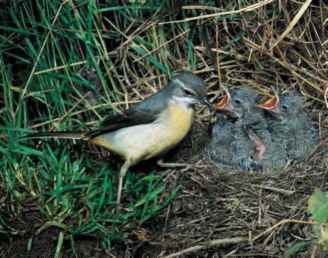 Some wagtail and pipit species defend feeding territories outside the breeding season. For example, rock pipits defend stretches of coastline and wagtails defend stretches of shoreline adjacent to open flowing or still water. Wagtails are lively and attractive birds, and commensal species are usually fearless of humans. Wagtails are so named because they frequently wag their tails up and down. Pipits also perform this movement, though less strongly, but the olive-backed pipit pumps its tail as vigorously as a wagtail. Wagtails and pipits either walk with a rather deliberate gait or run at great speed over the ground. To escape detection, pipits and longclaws are adept at crouching in short vegetation and moving quietly through short ground vegetation, adopting an upright stance to look around. Forest and woodland species such as the Sokoke, striped and bush pipits are often unobtrusive and relatively difficult to locate. complex and varied (e.g., in Sprague's pipit). Wagtails have simple, often quite melodious songs, while the longclaws have distinctive voices, giving whistled, melodious calls and simple songs. Flight calls are common in all species in the family, and are of great use in identifying pipits. Most pipits and wagtails are migratory. The species that breed in temperate regions are usually medium- to longdistance migrants, whereas those breeding further south are usually short-distance migrants or residents. Many Palearctic wagtails and pipits migrate to tropical Africa and Asia for the winter. The correndera pipit is unique among South American endemic pipits in having some migratory movements.